Donors include individuals and businesses who wish to contribute to an array of non-profit organizations serving Nelson County humanitarian needs. Donations replenish NCCF coffers to fund approximately 14 grants per year totaling more than $100,000. Nelson County residents are truly grateful for donors’ support. A former public affairs professional, Barbara Gibb has been a go-getter all her life. She channeled her talents and energy in retirement to help the NCCF get on its feet and broaden its impact on Nelson County residents in need. Another longtime member of the Nelson County Community Fund (NCCF), and former co-chair of the Nelson County Advisory Committee (NCAC), Barbara Gibb first had an active career in public affairs. This included jobs with both the First Federal Savings and Loan in Chicago, and the New York Stock Exchange. After moving with her family to Northern Virginia, she worked in public affairs for Youth for Understanding, a foreign exchange student non-profit organization, and at Children’s National Medical Center in Washington, DC. Barbara spoke recently with NCAC member and former co-chair, Jane Francis, about her experiences as a dedicated volunteer in Nelson County. What attracted you to Nelson County? Why did you decide to live here? Like many D.C. area residents, we discovered Wintergreen as skiers, and we later built a house on the mountain as a family getaway on weekends. My husband, Hank, and I retired and moved to Wintergreen fulltime in 1995. Hank started a property management company, and I embraced a new career as a full-time volunteer. My first experience as a volunteer was as a docent for Oak Ridge Estate, the historic home of Thomas Fortune Ryan in Arrington. That’s where I was introduced to Nelson County history and met people from around the county. Nelson County is the happiest place I have ever lived. In 1989, I stumbled upon the Coleman House in Stoney Creek. A home of an old Nelson County family, the house was originally built in 1850. It burned in 1900 and was rebuilt. We met a member of the Coleman family and got more involved in Nelson County history. Then Hank and I moved into the Coleman House in 2001. How did you become involved with the Nelson County Advisory Committee? I’m not exactly sure. The Nelson County Advisory Committee got started in 1999. Ed Stemmler, a retired physician and a resident of Wintergreen, was one of the founders of the committee, along with Joe Steele (who still serves on the NCAC). Ed knew Andrew Hodson (founder of Veritas Vineyard and Winery) from the University of Pennsylvania Medical School. I remember that Ed asked Andrew and me to co-chair the advisory committee in about 2002. I served with Andrew as a co-chair of NCAC until stepping down in 2014. Over this period, NCCF grew tremendously, eventually awarding $100,000 annually in grants to numerous organizations serving Nelson County. How did the Nelson County Advocacy Committee and NCCF function in the early days? The NCAC would raise about $20,000 a year from annual appeals. The committee soon found that amount was inadequate to meet the humanitarian needs of the county. Andrew decided that we needed an event to raise more money for residents in Nelson County. Thus, the Opportunity Ball began in 2004, and was hosted by and held at Veritas Winery for ten events. What were some of the challenges you faced on the NCAC? The greatest challenge was never having enough money to meet all the needs. The revenue raised at the Opportunity Balls helped a great deal to extend the ability of the NCAC to award grants to more organizations for more money. The downside of the Opportunity Balls was that it created incredible burn-out. After someone had chaired the event, she was pretty much done! The event demanded so much time and effort, even though the results really were amazing. What are some of the successes? The committee worked hard to improve the grants process. We started doing site visits as part of the process of awarding grants. Committee members either individually or in pairs would select organizations which had applied for funding and schedule a time to go and meet with staff, discuss the grant application, and tour the facility or office. This was so valuable! Our enthusiasm would grow as we were exposed to the needs of the many worthy nonprofit organizations in Nelson County. Seeing what these needs were first hand really made us motivated to help in any way we could. Margaret Morton, who also served on the committee, was very influential. Margaret worked for many years as the outreach coordinator for Monticello Area Community Action Agency, and was very familiar with the needs of families in Nelson County. George Krieger, another member of the committee who is the executive director of Nelson County Community Development Foundation, was very helpful. Through George, we were able to visit homes in dire conditions. Funds from the grants were used to install indoor plumbing and handicapped ramps so that the elderly and disabled residents could remain in their homes. I also am proud of helping to start the county’s first dental clinic. The needs of young and old in the county for dental care were extreme and being unmet. Barbara and other NCAC members, including Joe Steele, identified a dentist, who had retired to Wintergreen, to help in the planning. With NCCF grants, they established a mobile unit on the grounds of RVCC to house the dental clinic. The dental clinic fell on hard times when the practicing dentist developed back problems and could no longer work, and no other dentists could be found to take on the clinic. Obtaining insurance also was a major hindrance. Eventually a dental clinic was established at Blue Ridge Medical Center, which operates it currently. What would you say to encourage others to volunteer as you have done for so long in the Nelson community? I love Nelson County and the Nelson County Community Fund. It was a joy for me to work with people to do good for Nelson County. I want NCCF to succeed! I am so glad the NCAC has new and valuable members, as well as important sustaining ones. It is a very good organization. I love all that is happening and will happen in the future. Click this link to read interviews with founders and other key donors to the NCCF. Join the hundreds of your neighbors who are supporting the Nelson County Community Fund. Click here to go to our Donate page. 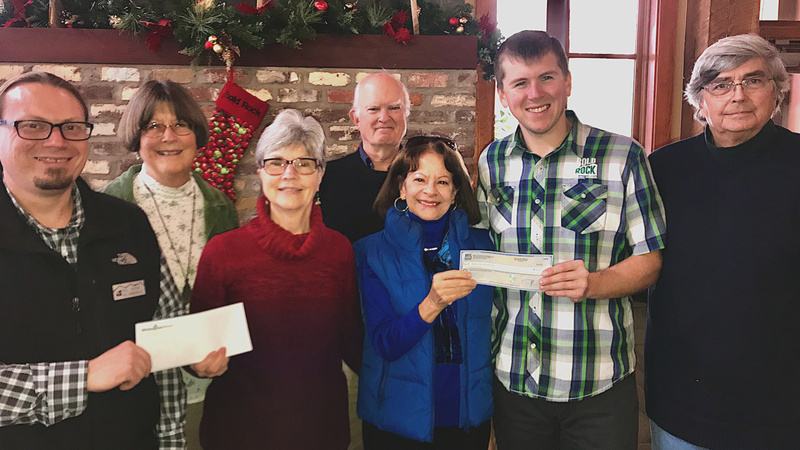 NCCF received a contribution of $1,500 from Wintergreen Resort and $500 from Bold Rock Hard Cider as proceeds from the Be Thankful 5K at Thanksgiving 2018. The course followed the trails of Rockfish Valley Foundation. Wintergreen Resort has supported NCCF since 2011 by donating a total of over $15,000 in proceeds from the 5K. Bold Rock has contributed a total of $1,000 over the past two years. NCCF is grateful to these Nelson County businesses and nonprofits for this support. 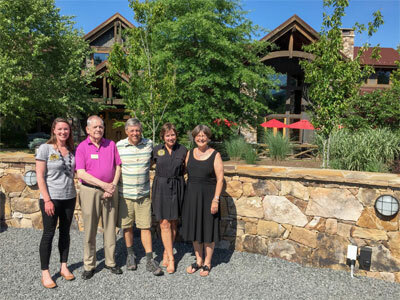 Pictured left to right are Elizabeth Tuel, Devils Backbone corporate social responsibility manager; Joe Steele, founder and treasurer, NCAC, Steve and Heidi Crandall, founders of Devils Backbone; and Jane Francis, co-chair, Advisory Committee. Please get in touch with us if you are interested in learning more about the Nelson County Community Fund. We also welcome your questions, comments, and suggestions.